The retired boxer expects to be ready for UFC in the next “six to eight months” but wants to be paid big bucks before he steps into an octagon. Retired boxer Floyd Mayweather has given the clearest indication yet that he will transition into mixed martial arts and take the UFC world by storm. In a revealing video interview with TMZ Sports, Mayweather confirmed he had been texting UFC welterweight champion Tyron Woodley regarding a training program. He then graded his own wrestling, kickboxing, and boxing skills from one to 10 before claiming he would be UFC-ready by the end of the year. 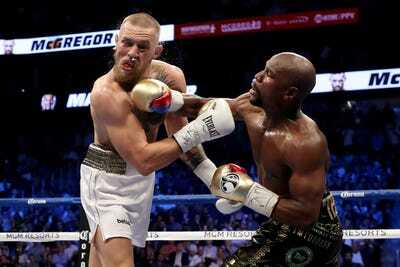 Mayweather, an unbeaten five-weight world champion boxer, mastered the art of boxing years ago. His 10th round knockout win over Conor McGregor in 2017 preserved a flawless professional boxing record of 50 victories from 50 bouts. But the 41-year-old will effectively be starting anew should he compete in UFC, and he knows fully well how “difficult” the transition will be. Christian Petersen/GettyMayweather beat McGregor up in a boxing bout last year. Mayweather then graded his mixed martial arts skills, starting with wrestling, from one to 10. Mayweather had previously spoken of “a billion dollar” discussion to return to the fight game but refused to elaborate on whether he would have a warm-up bout in UFC or challenge McGregor for one more rodeo. For Mayweather, “It’s all about presenting the right numbers.” And that means he wants to get paid for his blood, sweat, and tears.